Twitter is where political conversations happen and where you can see all sides of a conversation especially during the #Debate2019 that aired last week. 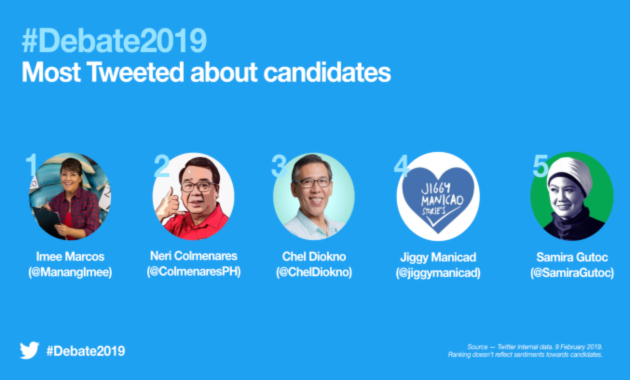 From press freedom and economy to criminal liability and political dynasties; candidates and Filipinos worldwide shared their thoughts on Twitter real time. The senatoriables were put on the hot seat during the first part of the debate as seasoned journalists served as panelists who threw questions on relevant national and political issues, and grilled the candidates on their competencies and track records. Tweeps applauded them for their straightforwardness. At the second part of the debate, the candidates had a face-off with one another. They were given the chance to explain their stand on certain issues. As the debate intensified, Tweeps shared their reactions and vent their emotions as the candidates grilled fellow senatoriables. Viewers of the GMA Senatorial Face-off expressed their delight to what they consider a well-researched program. Sony teams up with The Right Side to run a celebration contest on social media and outdoor to give away three of its latest smart ..
No scare tactics, just elegant and genuine support for cancer awareness in M&C Saatchi's new campaign for the Cancer Research .. The brand was unwillingly dragged into the conversation after a video surfaced of a young couple having a scuffle with an elderly ..